The following material summarizes analysis, research and discussion by music teachers, administrators and music advocates. These people came together at several meetings to share information about reductions in school music programs that are proposed in school districts from time to time. What aspects of the music program seem to be targets for reduction? What are the likely reasons for proposing these particular cuts? What are some effective arguments in response to the proposed program cuts? An essential first step in communicating any of the following information is to decide who are the best advocates. It is clear that in most cases parents, students and other community members are the most effective advocates for the music program. A second step is to provide advocates with accurate, up-to-date information that includes local data as well as statements, opinions and research from state and national sources. General statements about the importance of music may not be effective if a proposed program cut is quite specific and affects only a portion of the program. It is important to focus specifically on the proposed cut and both the long range and short range impact the cut will have on students, the school and the community. Remind others that the U.S. Congress has identified music as a core subject on par with other ‘traditional’ studies. Finally, a comprehensive education demands a balance between creative/aesthetic experience and other academic studies. Interruption in the school day. Less important than other “special” programs (reading recovery, counseling, etc.). Equity (why should instrumental music begin before other opportunities). Save money (staff, equipment, supply reductions). Weak documentation of best age to begin instruction in instrumental music. Instructional time is needed for other (high priority) academic subjects that are assessed. Dropout rate between beginning level and high school. School opportunities should be structured to meet student/parent interests rather than teacher/administrative convenience (relate to the “consumers”). Research shows that “pullout” music programs do not have a negative effect on achievement. Students in music actually score higher on standardized tests at all levels. Impact on overall student development is very positive: auditory, perceptual, aesthetic, work ethic – both immediate response and long range response. Stress the value to the student. Music study positively influences achievement in other subjects. Tends to involve parents more as partners in learning. Elementary school is physiologically appropriate for learning instrumental music. Does not interfere or compete with other opportunities which become available at middle school. Has great value and impact at this younger age. “Musical Intelligence” (Howard Gardner, Frames of Mind) needs to be developed at a young age. 4th & 5th grade students are ready for some kind of specialization in their learning. Need to offer options to build on individual motivations and “special” intelligences. Need to provide equity of opportunity not based on social/cultural/economic factors. Need to provide an inclusive program, rather than exclusive. Each year of experience has value in itself. Some go on to other music experiences within the school or community. Look at the long term effects: eventual impact on middle and high school enrollment in music. Examine concept of John Benham’s “Reverse Economics.” In most cases, music teachers have a higher student-teacher ratio than other teachers. Who will teach the children who are no longer in music? Rooms used for elementary instrumental music instruction may also be available part of the time for other instruction or special needs. Reduced instruction by specialists in elementary general music. Reduce staff and save money. Inability to find qualified/certified music specialists. Music can be incorporated into core subjects as a tool, and need not be taught separately. Trend toward integration of subject areas. subsequent learning and interest in music. Music is an independent core subject. While it can support other studies, it requires an independent curriculum. Wisconsin is a good state in which to teach. Recruiting efforts can be broadened. 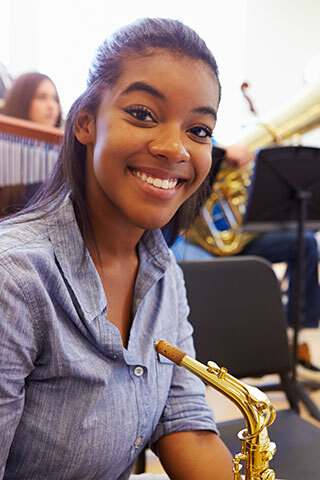 The expertise of the music teacher brings unique experiences to students in music class and can also enrich other subjects. Refer to ‘Eliminating elementary instrumental instruction.’ Some of the same arguments apply. Eliminate individual or small group lessons in instrumental music. Eliminate staff and save money. Shortage of facilities for instruction. Unique instructional pattern in comparison to other subjects (special treatment). Uniqueness of music as a discipline and area of learning. Instruction should be based on the optimum way to learn within a subject rather than forcing everything into one scheduling pattern. Equity is an important issue: Should music lessons only be available to those who can afford to pay for them by studying privately outside of school? Reduce music department supervisor or coordinator. The role does not provide direct services to students. Coordination ensures the effective use of resources. Coordination of curriculum, instruction and activities is important. Expertise in hiring effective staff is important. Important to maintain standards through monitoring and supervision of programs. Need to provide leadership in curriculum development and unification. Initiating relevant staff development is important. Music is a unique discipline with special administrative needs within the school program (equipment, safety issues, visibility within the community). Traveling teachers must have their special needs met to be effective. Reduce or eliminate middle school general music classes. Apathy of current teaching staff. Redundant for those enrolled in choral or instrumental music. Instructional time is needed for other core studies. Wisconsin state education laws require that general music be offered in the middle school. Music offers a variety of options for exploration, consistent with middle school philosophy. Student interest is an argument for curriculum revision, not course reduction. Teacher disinterest is not a valid reason to deprive students of educational opportunity. Reduce instructional time for middle and high school performing groups. Present scheduling model doesn’t work with block scheduling. There is need to allocate instructional time to “traditional core” subjects. Academic schedules should respect the learning needs of students in all subjects. Community expectations for student music performance require more student contact time – not less. Many schools have implemented block scheduling while maintaining some yearlong courses. The long term implications of this reduction will affect individual achievement, performing group quality, and ability to serve school/community events.